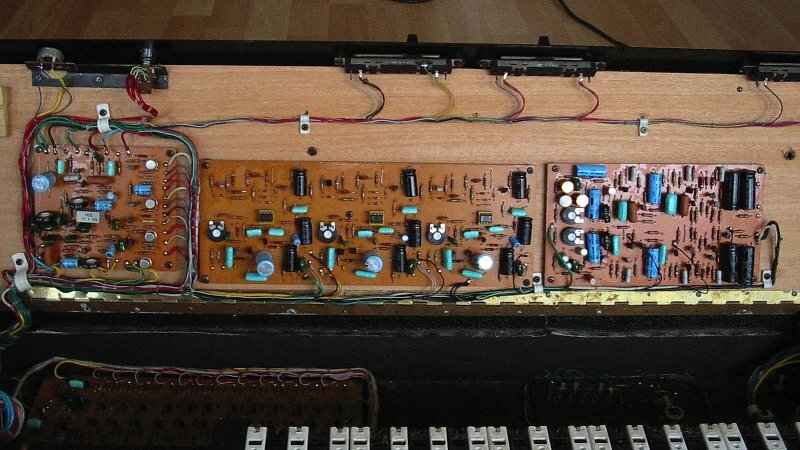 Build from 1973 to 1976 it was one of the better string sound keyboards. It sounded better then the other italian string keyboards of that time. This was due to the fact, that each of the 49 keys got its own simple AD-envelope. This was way better then a simple on/off one of more organ like sounding string machines or one paraphonic envelope for all keys together. The keyboard is always split int two nearly equal sized ranges. In each of these ranges you can mix a combination of three string sounds. Each string sound was a copy of the other but one octave higher in pitch. And you can control the attack and the decay times per keyboard zone. Ranging from zero attack or decay to a smooth long one. Well scalled mins and maxes. And on the black metal above the volume sliders you find the trim pot hole for adjusting the rather stable master pitch of this instrument. The push buttom right of this is labeled "Orchestra". This raclls a preset selection of all the available parameters. But don't be fooled, this will not imitate a real orchestra at all. It will just set the strings to a nice mix and envelope. Of cause there is a ensemble effect added which sound very much like other ensemble effects based on tripple bucket brigade transistor arrays with two controlling LFOs. 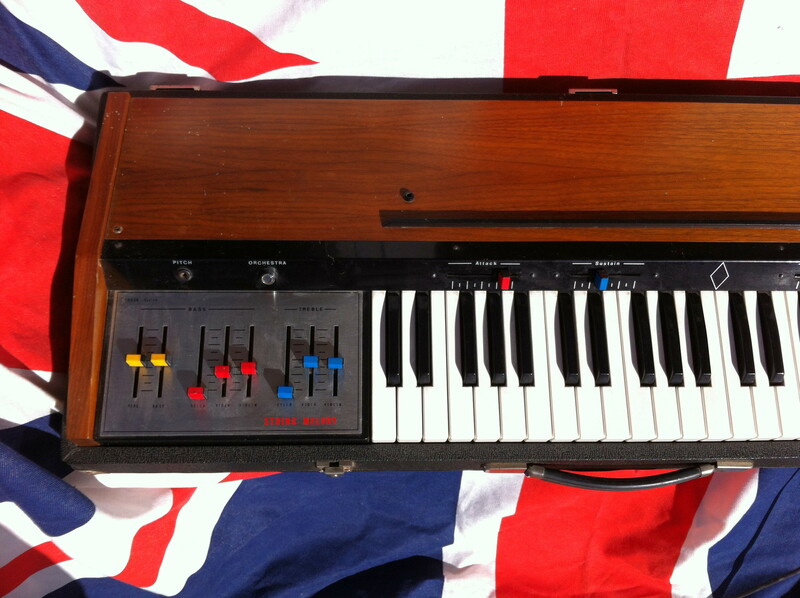 Like the one used in the ELKA Rhapsody, the Crumer Perfourmer or in the Wersi Voice effect. They technically very related and using sharing more or less the same parts. But with little changes here and there. 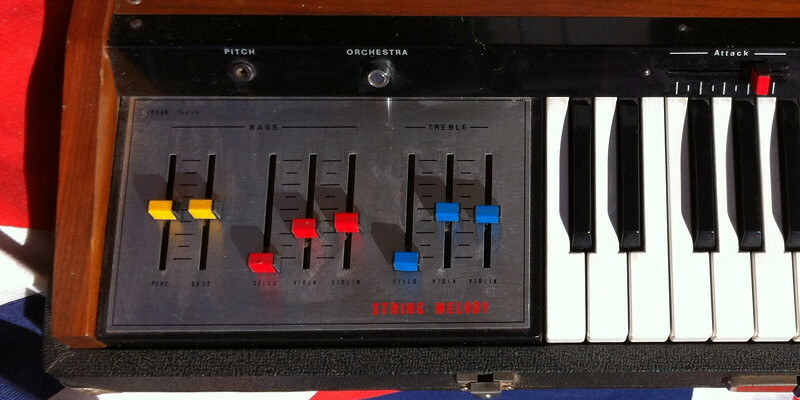 The Logan String Melody II (1977 - 1980) got addition parameters and added presets like ORGAN. The Wersi version of this one also added parameters for changing more sound parameters. 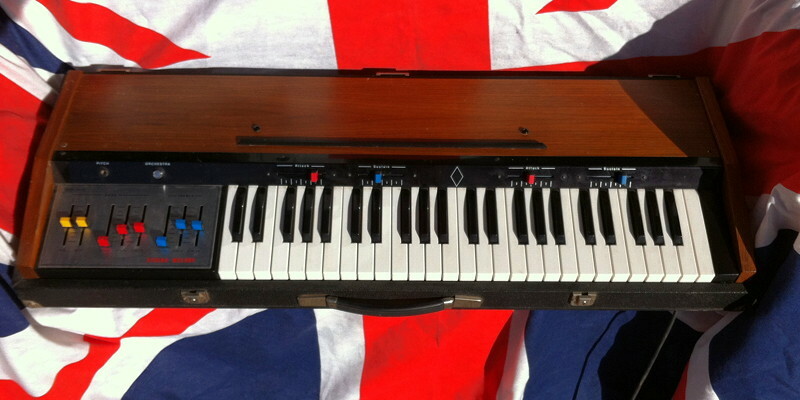 Including HAWAII (the typical Wersi 1 octave glide down and back upward again), simple tone controls and a pitchbend slider named SLALOM. Well, except for the tone control these are not the most usefull additions possible. The left hand range also give you the option for adding a monophonic bass sound with extra volume and percusion attack control (the two yellow sliders to the very left). You open the Logan as easy as other italian string machines from this time: undo 2 screws on the top to open the top lid. The descrete build master oscillator is tuned to 1059 kHz and feed into a MK50240/1 top octave divider chip (a M50241 like chip). This chips divides the ingoing top oscillator's square wave into 12 different squarewaves that are each tuned to one of the 12 notes of an equal tempered octave. These 12 signals are called the top octave, because they represent the highest available tuned to keyboard notes this instrument is able to play. Ranging from 4184,7708 Hz (a "B") to 2215,4812 Hz (a "C"). And undo screw on the bottom to be able to flap the keyboard action upwards to see what's below. On the right we have the two LFOs of the tripple chorus. One LFO is set to slow (about 0.6 Hz) while the other is set faster (6.0 Hz). Then each LFO is phase shifted by zero, 120¡ (1/3 of the cycle duty) and 240¡ (2/3 of the cycle duty). Each of the three differend phases is then mixed together with the same amount of phase shifted LFO at a ratio of 79% of the slow LFO and 21% of faster LFO. This gives a complex modulation of the choruses in order to get an ensemble effect. 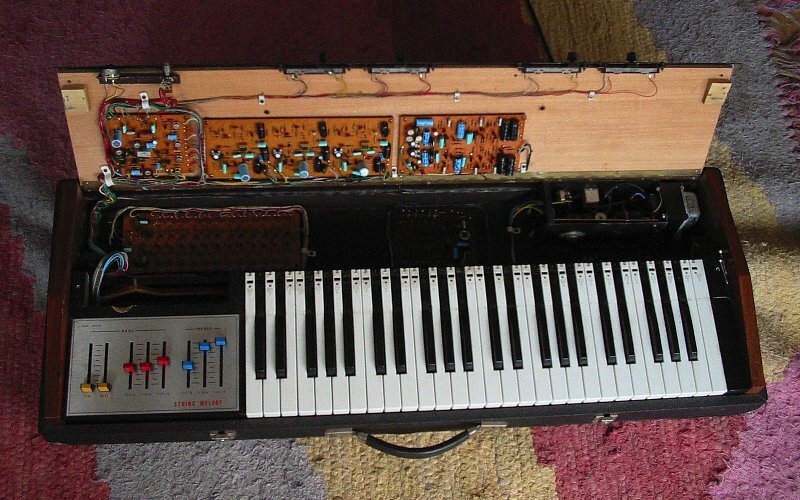 Under keyboard is the big board with the electronics needed for each individual key. 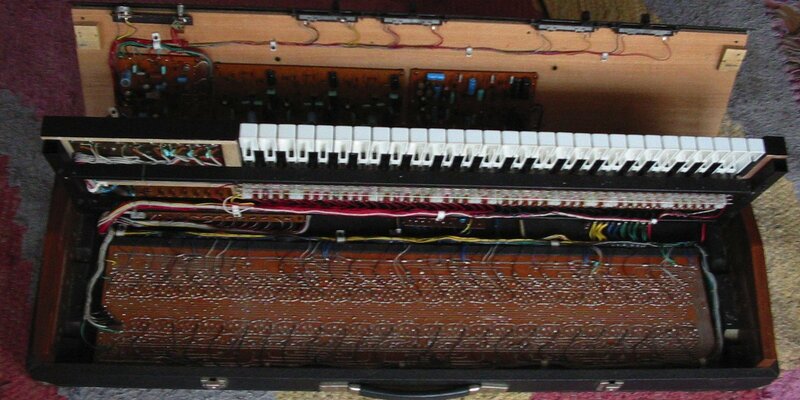 Each key uses a SAJ210 divider chip to divide the frequency of the top octave oscillator down to the desired key and to the three different octaves (4', 8' and 16') needed for this key.